Alpadia Berlin proposes an attractive variety of German language courses to help you improve your skills and expand your professional development. Whether you need to prepare for an official exam or want to advance at a more leisurely pace to enjoy your free time in Berlin, we can offer classes that fulfil your needs. 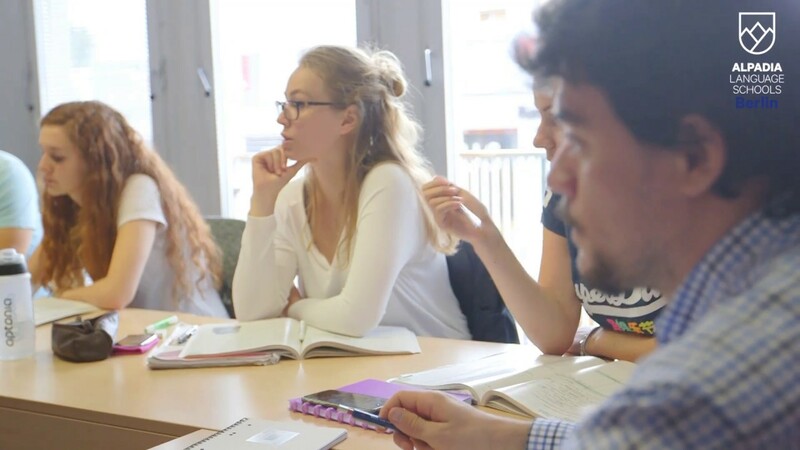 Our course structure is based on the Common European Framework of Reference for Languages (CEFR) and all our placement tests are given before you arrive at the school, so you start learning German from the very first morning! Using various dynamic teaching methods, this course offers an intensive and in-depth study of the German language with five additional weekly lessons dedicated to oral communication. The minimum duration for A1* absolute beginners is two weeks. *Specific start dates for absolute beginners > A1. This German course offers a solid learning experience while allowing you plenty of free time to exercise your language skills during the school's extra-curricular activities around Berlin. The minimum duration for A1* absolute beginners is two weeks. *Specific start dates for absolute beginners > A1. Best suited to students who seek rapid progress of their German, this course option provides you an intensive approach with a specific focus on writing skills. The minimum duration for A1* absolute beginners is two weeks. *Specific start dates for absolute beginners > A1. This personal one-to-one learning experience allows you to intensively advance on the core German language skills that you wish to develop and improve. This ultimate combination course is designed to help you acquire a deeper understanding of oral and written German, blending the benefits of both private and group classes. The minimum duration for A1* absolute beginners is two weeks. *Specific start dates for absolute beginners > A1. Designed for students preparing for the German TELC, TestDaF or Goethe exam, this preparatory course provides you with an extensive and specific learning experience to ensure examinations are mastered! Our vast network of local families allows us to offer you an enriching experience immersed in the German culture and language. Located close to our course centre, you can choose from either a half-board or breakfast-only meal option. Single or double rooms are available with a shared kitchen and bathroom. From the most basic to the most luxurious options, we have contacts with local hotels and B&Bs close to the school for those students who seek accommodation outside our standard selection. Our residence features fully-furnished single rooms equipped with ample storage space, a wardrobe, a desk, a kitchenette and private bathroom. The central location provides you with a fantastic base from which to discover the city and its numerous cultural attractions nearby. Unique to Alpadia Berlin, this type of accommodation mixes our students with other locals in shared apartments, encouraging the ultimate language immersion experience! Sleeping in a single room, this option is self-catering, with access to a shared kitchen, bathroom and communal lounge area. Ideally located in the vicinity of the city's main attractions, our carefully selected student apartments are close to public transport and offer the opportunity of greater independence without the solitude! Single or double rooms are available along with a shared kitchen and communal bathroom with washing machine. During your German language study stay at Alpadia Berlin, get carried away by the hustle and bustle of this vibrant capital. Alpadia offers a wide range of weekly activities and excursions in order to discover this multifaceted city. From museum visits, exhibitions, guided city tours, Biergarten evenings, open-air cinema viewings at the Kreuzberg or Stammtisch in Schöneberg, to exploring the “country” side of Berlin and enjoying excursions to Dresden and its Zwinger, or Potsdam and its Sanssouci Castle. Since 1996, with the support of the city, this international dance festival has established itself as an important platform for young and upcoming dancers in Berlin. Open to dancers based in Berlin, this yearly festival offers a framework for them to showcase their new and existing productions. This unique transdisciplinary platform seeks to create a transitory space for artistic, academic, activist and everyday expression. The festival engages in reflective, aesthetic and speculative positions in between art, technology and culture. With a variety of workshops, talks, performances, music and screenings, this unique cultural event should not be missed! In its 68th year and welcoming over 300’000 visitors, this internationally renowned film festival presents both long and short-format films and documentaries from the world over. Discover a wealth of cinematic gems and spot some of the biggest names in cinema at Berlinale, one of the most important film festivals of the year! One of the biggest and most important festivals in Europe, this international festival for improvisational theatre and music has delighted its public since 2001. Dealing with different themes every year, the performers explore these topics using spontaneity and the process of collective storytelling. Explore the eclectic collection of music presented at this festival under the theme of time and the digital age. Together with conferences and concerts, this event proposes a unique collection of performances underpinned by a socio-political, philosophical and artistic dimension. This yearly event has been running since before the reunification of Germany and brings together both young and adult participants. Having begun during the Cold War and continued after the Berlin wall came down, this marathon welcomes over 20'000 runners from over 60 countries each year! An event of mini-events, this week long festival connects industry professionals, media and gamers in Berlin to bring together business, technology and culture. With workshops, conferences, screenings and plenty of games, this event is recommended for any avid gamer! Since 1988, this intense one-day local festival brings together international and national musicians and artists as well as offering a platform for dialogue on cultural and political issues through conferences and workshops. Discover this 4-day urban street festival that takes place in the heart of Berlin, celebrating the diversity of local culture. With over 100 bands and DJs, 200 performers and street artists, there is also a street parade that turns the city into a massive party. Celebrated all over the globe as Worldwide Music Day, the Fête de la Musique in Berlin plays tribute to both local and international artists. Since 1995, this free event gathers a wealth of musicians, bands, orchestras, choirs, soloists and DJs who perform around the city. Enjoy this jazz music street festival in the trendy district of Kreuzberg. A hub of creativity and multicultural exchange, this weekend event provides entertainment for the whole family, featuring plenty of culinary delights from all over the world. Discover an open-air classical music festival on Berlin's fascinating square, the historic Gendarmenmarkt. Boasting a programme of world-renowned musicians, this long weekend offers spectators a rich journey through various musical genres and epochs. Experience a classical music festival that presents the best symphonic youth orchestras from around the world. Founded in 2000, this festival offers a platform for youth orchestras to perform and also generally promotes classical music in Berlin. This celebration of gay, lesbian, bi-sexual and transgender culture has taken place since 1979 in Berlin. Taking its name from the New York’s Christopher Street, where the Stonewall Riots took place, this event attracts over a million visitors and is both a celebration and a demonstration against discrimination and for the rights of the gay, lesbian, bi-sexual and transgender community. Around for almost 20 years, this world-renowned free beer festival attracts around 800’000 visitors from all over the world. For the beer lover, this is a unique experience to taste beers from over 300 breweries, from over 80 countries, with over 2’000 varieties of beer, both local and international. For lovers of dance, this international dance festival is not to be missed! With a wealth of performances over two weeks, some of the biggest names in dance are present to perform astounding choreography from the world over. Discover and explore a wealth of culture and history at night! Once a year, from 6pm to 2am, over 100 museums, collections, archives, memorials and exhibition houses welcome visitors who can enjoy late night tours in a unique atmosphere. For those who enjoy exploring innovative consumer electronics and discovering the latest trends, make sure not to miss the Consumer Electronics Unlimited trade show. Showcasing global innovations in electronics and home appliances for a digital world, this exhibition highlights extraordinary products and revolutionary technologies. Running, literally, for over 40 years, this annual, BMW-sponsored marathon weekend is open to all ages. With over 40’000 participants and one million spectators, this city-wide race brings professional athletes and amateurs together over the 42 km course. Discover and be delighted by the magical and marvellous experience of Berlin during the Festival of Lights. For over 10 years, every October, the city is transformed and illuminated with spectacular displays of light art and creative installations. Celebrate New Year’s Eve at the biggest party in Berlin, at the Brandenburg Gate. Boasting around one million visitors, there are over two kilometres of stages, party tents, light and laser shows, food stalls and drink stands, not to mention a whole host of activities to keep you entertained until the impressive firework display at midnight. Learning German in Berlin is an experience most students never forget. Offering a low cost of living, a rich social life, an abundance of culture and history along with an alternative artistic scene, Berlin is a quality destination for learning German and preparing for entry into a higher education programme. Our German university partners (both public and private) offer Bachelors in Engineering, Computer Science, Business, Social Science, Healthcare and Music. Berlin is not only a fantastic destination to discover the German language and culture, but also offers students lots of opportunities for work placements within different industry sectors: from hospitality to the arts, from sales to social work as well as volunteering possibilities with Caritas and GiveSomethingBackToBerlin. With affordable living prices, efficient transport links and a great social life, students can truly benefit from the dynamic city environment where there are always plenty of different places to explore and new people to meet. Tuition, learning material, assessment test, Alpadia certificate, activity programme, student card, accommodation placement and taxes. Dates for direct access to university – with high-school diploma equivalent to the German "Abitur"
Students who are non-European nationals will need to make sure that they have the necessary documents to enter and remain in Germany for the duration of their stay. Click on the link below to see our dedicated student visa page. Felix runs Alpadia Berlin, which counts 50 teachers. He has been with Alpadia since 1997 and successively worked as a German teacher, manager of the German department, trainer and exam trainer before taking over the direction of the school. Felix studied law, Slavic studies and German as a foreign language and has worked for various language schools, adult education centres and exam centres. Katrin is responsible for the student services and support at Alpadia Berlin and acts as a substitute for the school director. After her language and business studies she gained much experience in several economic and service institutions in Switzerland, the Netherlands and Germany. Before Katrin joined Alpadia Berlin in 2013, she worked during many years as a Sales Manager for a language school in Zurich. Anja is in charge of course organization and quality control. She is responsible for testing your language skills to make sure you are placed in the right group and will help you with all of your questions regarding your German courses. Anja spent many years as a teacher trainer and today looks after the teachers at Alpadia, supporting them in their professional development. She studied German philology. Passionate about the oceans and all undersea creatures, she also graduated in Biology.